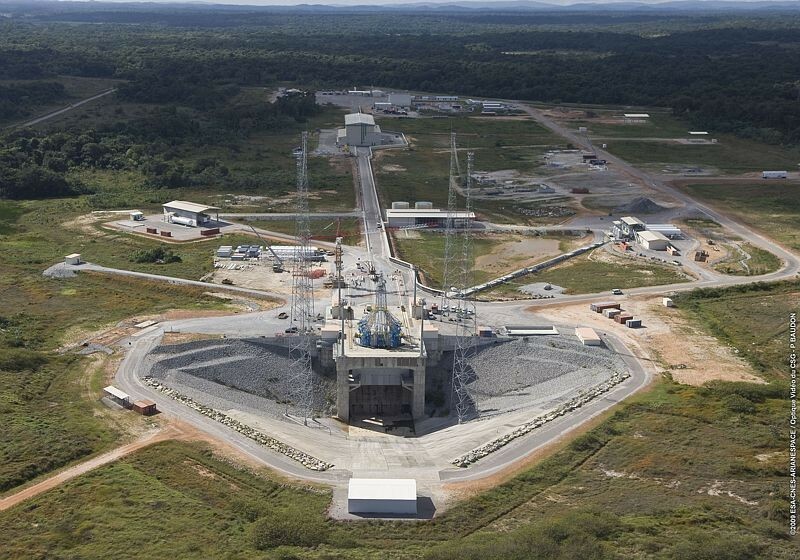 The Guiana Space Centre (CSG) has completed construction of a new launch complex, not far from the Ariane 5 facility. Later this year, it will become home to a new recruit from Russia—the Soyuz rocket. A Soyuz rocket at the Baikonur cosmodrome in Kazakhstan. Credits: Roscosmos. 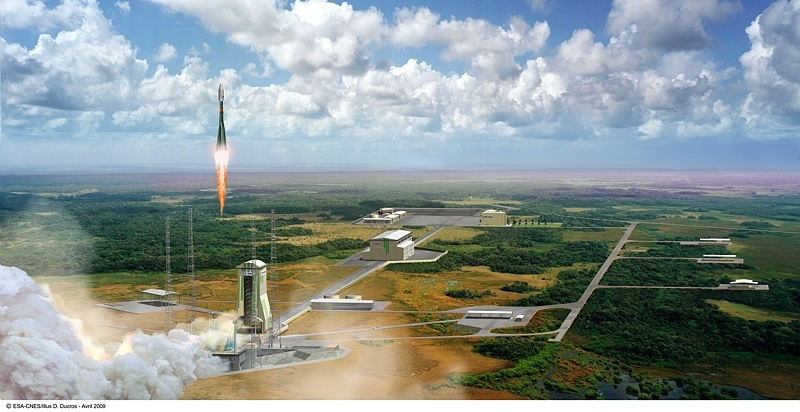 “Ariane 5 is optimally designed to place large satellites (5 to 10 tonnes) in geostationary transfer orbit. Using it for small payloads would not be profitable—it would be like hiring a truck to deliver a suitcase,” explains Jean-Marc Astorg, Deputy Director of CNES’s Launch Vehicles Directorate (DLA). For this reason, Europe decided to bring in a new launcher, smaller than Ariane 5 but bigger than Vega (1). Russia’s Soyuz rocket quickly emerged as the obvious choice—it is extremely reliable and ideally suited to deliver smaller satellites (2 or 3 tonnes) to geostationary orbit. It also has potential for human space missions as well. 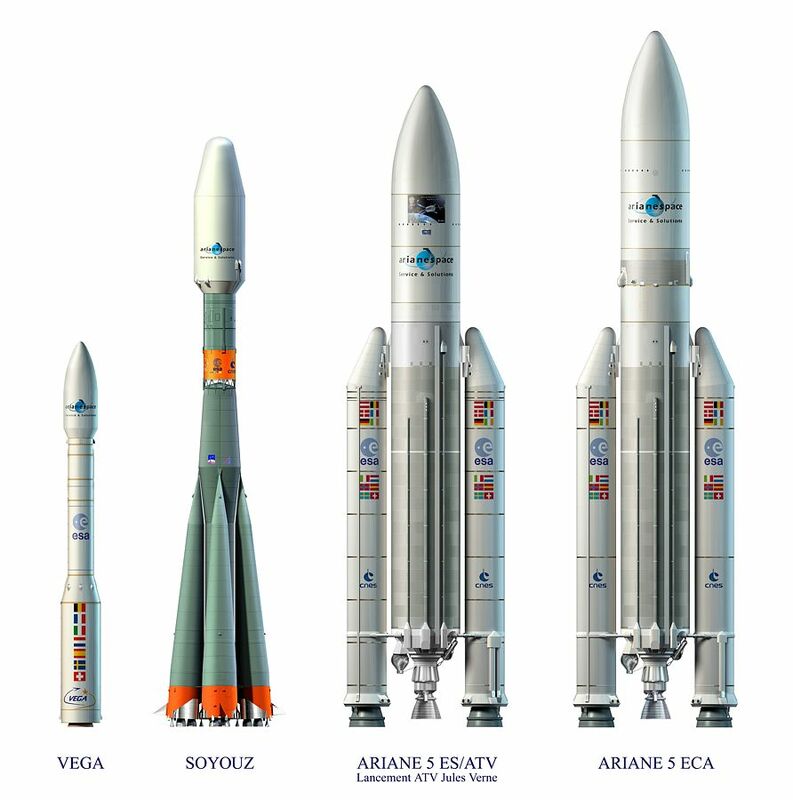 Europe’s launcher family: Vega, Soyuz and the 2 versions of Ariane 5. Credits: ESA/CNES/Arianespace. “Soyuz has been in continuous production in Russia since the 1950s and has a great future ahead of it. When the American space shuttle is retired from service, Soyuz will be the only launcher in the world to be used for human space missions,” adds Jean-Marc Astorg. From its new base in French Guiana, Soyuz’s lift capacity will double to 3 tonnes (compared with 1.5 tonnes when launched from Baikonur (2)). This is because the CSG is near the equator, which allows launchers to take maximum advantage of Earth’s rotational speed, known as the “slingshot effect”. Although the European version looks identical to the Russian Soyuz (and indeed is manufactured in Russia) there are some notable differences. “The European version is fitted with a neutralisation system, which allows teams on the ground to stop the launcher if it deviates from its trajectory,” says Jean-Marc Astorg. Progress at the Soyuz site in French Guiana, November 2009. Credits: CNES/ESA/Arianespace/P. Baudon. The new launch pad also features a number of enhancements. A mobile gantry, under assembly at the site, has been specially designed to integrate satellites with the launcher in the vertical position. Soyuz will be ready to fly from the CSG at the end of the year. Credits: ESA/CNES/Ill. D. Ducros. “The gantry’s metal structure will also provide protection for operators as they work on the launcher, where they are exposed to French Guiana’s humid climate, mosquito bites, ‘papillonite’ (3), etc.” he adds. While Russia continues to use Soyuz for government flights and human space missions, Europe expects to conduct 2 to 4 commercial satellite launches annually from Kourou. 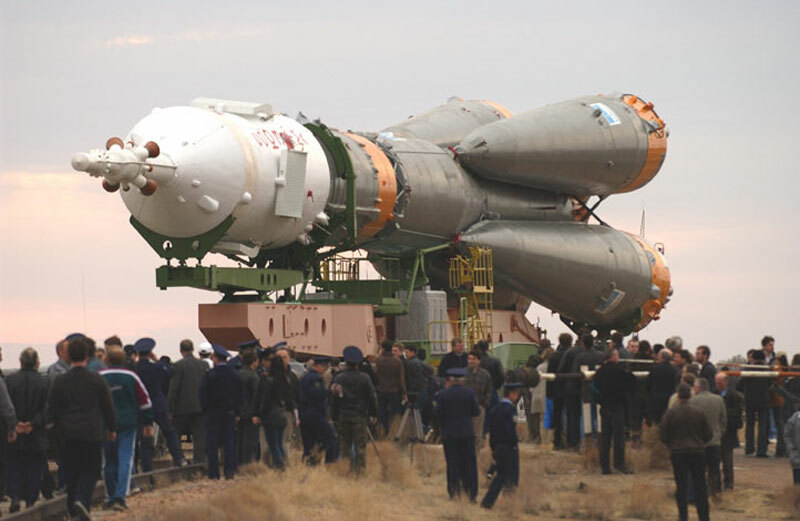 Europe’s 1st Soyuz launch is planned for late 2010. (1) Europe’s small launcher, designed to orbit satellites of a few hundred kilos. (2) Russian launch complex where Soyuz operations are based. (3) Skin irritation prevalent in French Guiana, caused by the urticating hairs of certain moths.